Mozilla is a very popular, and also very fast, internet browser in Indonesia. It has become so much widely-used in that Asian region that users have formed the Indonesian Mozilla Community and has also created its Firefox mascot named Kumi. 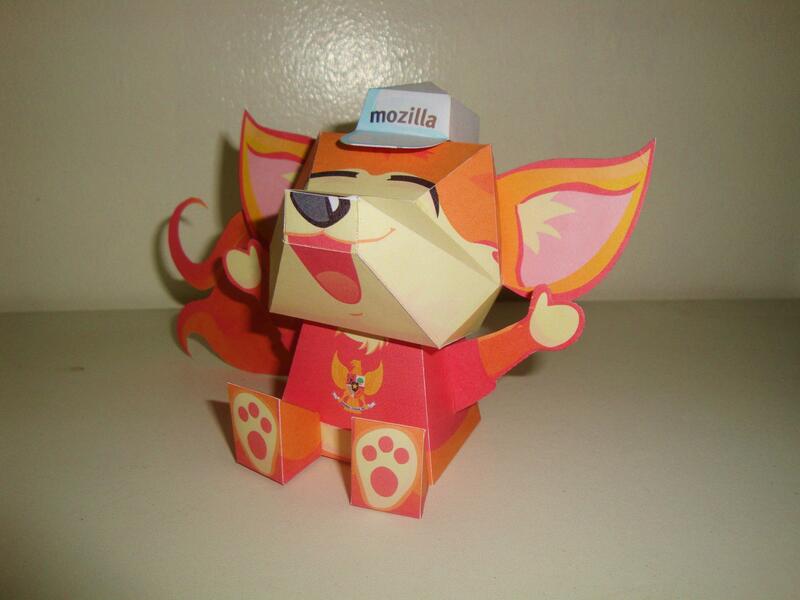 Kumi, like Mozilla, has also become quite popular that it has been released wearing a variety of costumes. The one I assembled here is named: Garuda di Dadaku edition (Garuda in my Chest). Garuda is a large mythical bird or bird-like entity that was often depicted in Hindu or Buddhist mythology. Garuda is also part of the symbol used by the Indonesian National Team, of which the team’s jersey is worn here by Kumi. The pattern itself is very straightforward and paper model beginners shall have no problem whatsoever in assembling it. If you want to try assembling this paper model, you may download the pattern and instructions at my Indonesian friend and fellow paper crafter, Salazad’s website [click here].